When shooting a video sequence you cannot always avoid recording some noise. Sometimes you might find out only in the editing suite that there are some disturbing audio signals in your footage. To fix this in the postproduction is usually very time consuming and often does not lead to the hoped for results. How often do you have failed to remove noise like hiss, wind noise or broadband noise from important scenes? 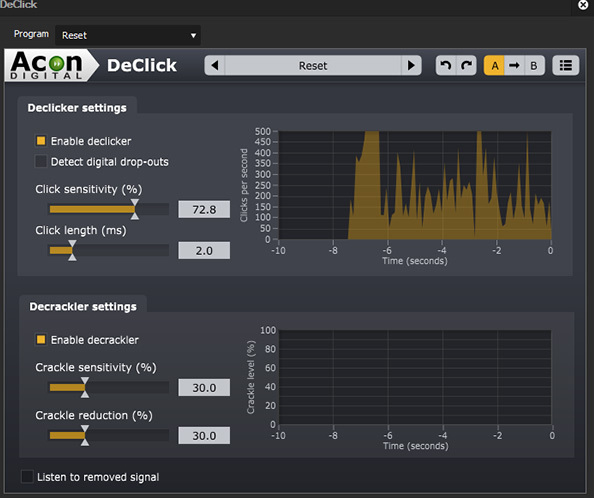 With ACON Digital Restauration Suite for EDIUS it is possible to reduce different kind of noise in less time and good quality. original signal and it’s character as possible during the noise reduction process. 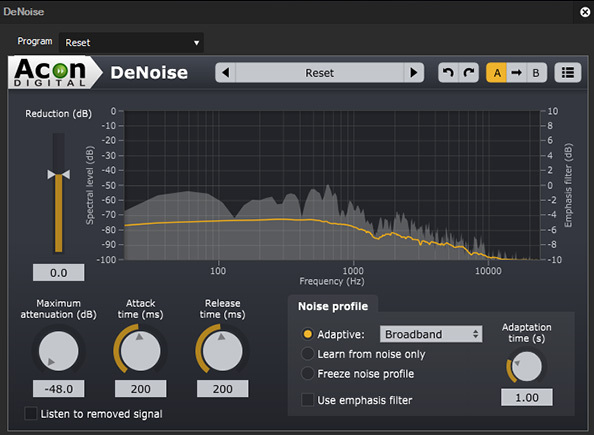 DeNoise is designed to reduce stationary noise such as broadband noise, hiss, wind noise, buzz and camera noise. You can freeze the noise profile anytime in order to perform the actual noise reduction. 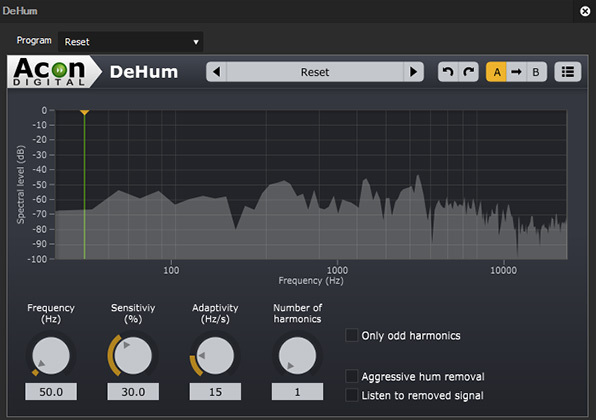 DeHum targets hum and buzz typically introduced by poorly grounded electrical equipment, but also other tonal noise sources like electrical motor noise. The integrated monitoring function allows you to only reply the audio signal that has to be removed. Using this function parameters can be set precisely. DeClick is designed to remove impulsive noise. Impulsive noise such as clicks and crackle are frequently encountered on LP and 78 RPM records, but also occur in digital recordings due to drop-outs or distorted data packets. Due to their metal sound these distortions can be very annoying. Experts recommend operating a camera manually instead of relying on automatic functions. This avoids disturbances regarding the volume, which occur when the automatic recording level control tries to set the level of an air condition in the background to the same level of the spoken words of an interviewee. But when setting the recording level manually clipping can occur. This happens during recording when the recording level is too high and the highest peaks cannot be correctly recorded. 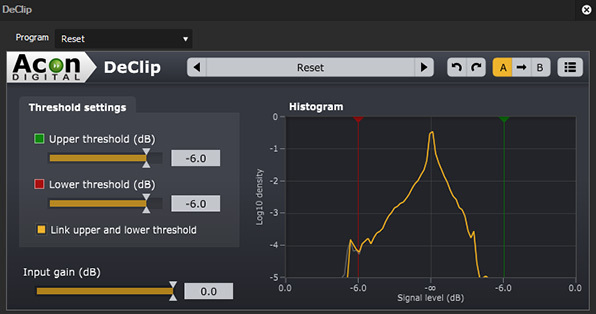 DeClip substitutes such distorted peaks with an estimation of the signal curve. Click here to find audio samples before and after being edited with Acon Digital Restoration Suite. ACON Digital Restauration Suite for EDIUS can be used perfectly in combination with Voxengo Voxformer. It allows you to have best audio quality for your EDIUS productions – for a small price. Tip: ACON Digital Restauration Suite for EDIUS is the optimal solution for users new in audio editing as well as a reasonably priced alternative for former users of ReduNoise, a 32-bit application which cannot be integrated in EDIUS 8/9 any longer. ACONoffersbetter performance and more options to improve your audio for a reasonable price.